Mark Garrido, Project Manager for the General Contractor on the project posted the following on Linkedin.com for Fine Art Conservation Laboratories (FACL, Inc.). “Scott, you provided the exact services we needed and did a wonderful job (consulting on mold damage on art in a historic structure). Thank you so much for your help. We look forward to a good working relationship with FACL into the future.” Brent G. Thompson, Director Historical Department, Church of Jesus Christ of Latter-day Saints. I can’t tell you how happy I am with your work on the portrait. It is just killer! ( I’m a guy, so I hate using words like fabulous or breathtaking) I find myself walking into the living room at least a couple of times a day and just staring at it. I can’t thank you all enough for a job well done. Please let everyone at FACL all know. All our best from here at the Reagan Library. Meet several of our art dealer clients with whom we have worked since 1987. The venue for this video is the LA Art Show – a fun place to meet art! Thumbtrack is a professional referral service and recommends FACL for art conservation and painting restoration services. After being selected in a competitive selection process, a four year project in Cedar Rapids Iowa City Hall involved working with departments in City Hall and other interested parties during the phases of working on each of the four murals to remove overpaint, clean, inpaint, consolidate detachments, and varnish. Production of media materials for public outreach and fundraising was also part of the project. “Mr. Haskins, B. Gen Chuck Yeager was here (Edwards Air Force Base) last week and we told him about your wonderful help with the signature wall in P-1. Talk to you soon!” From Major Hutchison. Over my professional career I’ve had many opportunities to work on military bases on historical murals, mostly. But my visit to Edwards Air Force Base was a bit different… they had a Flyer’s Wall in the Officer’s Club on base with signatures of many great and notable pilots. Major Hutchison was very interested in preserving the historical signatures on the wall and as we chatted I expressed a dream of mine to fly the speed of sound (or break the sound barrier). Shortly thereafter, this wonderful gesture on her part arrived in the mail, which I was thrilled to receive! 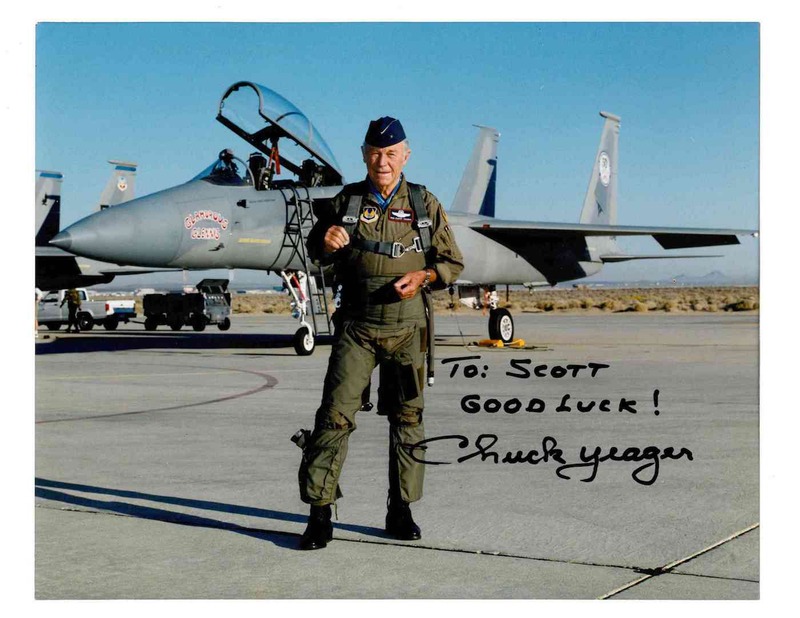 I consider Brigadier General Chuck Yeager’s breaking of the sound barrier a major technological and heroic event in my lifetime. collects art and gives a testimonial for art conservation services. Painting Restoration Hollywood Celebrity Testimonial Analysis of Art Los Angeles from Scott M. Haskins on Vimeo. I have a largish oil painting on canvas done by an uncle of mine which has not been cared for well and has a couple of small tears; I have it rolled in a tube. It has some sentimental value and I would like to hang it if I can make it presentable within reasonable costs. it is about 30X50 inches and about 70 years old; I just want it cleaned and minor repairs done on it. Do you have any idea how much it will cost so I may make a decision to proceed or not. Thanks Marci, it was a pleasure talking with you. I want to thank Scott for taking the time on a Sunday to speak to me about the repair process for a specific mural. He thoroughly explained what needed to be done and was happy to answer additional questions I had. I would highly recommend FACL for any of your art repair needs. Thanks again, Scott! My pleasure Warren. We’ll talk again soon after your testing. My husband and I were very cautious when looking for a professional art restorer ( we learned that the actual professional term is art conservator) to whom we wanted to entrust our inherited ripped painting. After several disappointing attempts we found FACL’s great website and interesting educational videos and we were very hopeful. Scott Haskins came to our home in Dana Point and explained clearly the options, processes and we enjoyed the visit very much. 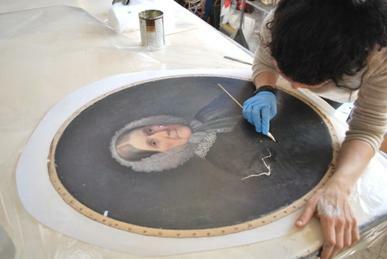 Today, just as FACL promised, our painting was returned to us and I was very amazed at the exceptional repair. Our painting looks better than we expected! The rip is completely non detectable with no patch. I couldn’t be more amazed at the magic of the wonderful work and professional service. Thank you!!!! Thank you Brett for leaving this nice comment… and thank you for trusting us with your nice piece of art. FACL restored an early 20th century pastel for me and they did an amazing job. Scott is very knowledgeable, plus he is a genuinely nice person and loves what he does. In addition to the restoration work, he had it matted and framed and it came out beautifully. Francesca, his office manager, is also pleasant to work with and great at what she does. I highly recommend FACL for any art restoration project and wouldn’t hesitate to use their services again. Thanks Harmony for your nice comments and for the opportunity to work with you on your mural. We enjoyed it thoroughly. I just had Scott and Diane come to my house to restore and protect a mural that is very close to my heart. It was painted by my good friend David Legaspi, who passed away several years ago – way too soon. All who knew him miss him dearly and his legacy lives on through his art all over Southern California. FACL helped to preserve this important legacy. Not only are Scott and Diane wonderful to be around, but they are hands down the best in the business!! Scott’s expertise and experience allows him to handle any circumstance to ensure that the art will live on in peak form. Thank you so much, Scott and Diane!! I’m very grateful. So glad that I found FACL! Appreciate Mr. Haskins’ quick return of a phone call from AZ inquiring about conservation of family painting. Looking forward to his suggestions for next steps and working with FACL. Thanks Jerren for the nice comments. I contacted FACL in October 2015 regarding an oil painting that has been part of my wife’s family for decades. Scott Haskins promptly returned my phone call and gave me details about their repair and restoration processes and experience working with several art galleries locally in Laguna Beach. We researched other local companies only to find that their processes did not seem as thorough and detailed as those used by FACL. I am confident that FACL is the right choice! Thanks Gene for your comment and for your call. Let me know if I can help further. This was the first time I have had to search out conservation services for a fine art oil painting I recently purchased. Your prompt reply to my initial email and our subsequent conversation helped me evaluate my options. I sincerely appreciated your suggestions for an easily done test to see if the slight damage was in the varnish or extended into the painting itself. As soon as my options are clear from the shipper who created the problem, I will be in touch as I have decided that your professional attention to my needs is the best way to return this painting to the best possible condition. This is a great page for people to send to friends. I’ll be sure to send a few people this way. Good work, keep it up! Thanks for your comment Walter. Best wishes. I met with Scott Haskins related to the possible restoration of a valuable original watercolor in a private collection. He was extremely knowledgeable, professional, and generous with his time, and I am convinced the advice he gave me was spot on. Thanks Elizabeth for the referral. I always appreciate your support and our association. To anyone reading this comment, Elizabeth is a great source for art and estate appraisals!! That testimonial page is very useful, thanks. Your testimonials blog summary is very useful…thanks for sharing it. I appreciate your video testimonials which are really impressive. I enjoyed the videos and would/could make one also applauding the service and quality of FACL, Scott Haskins and his team. We would not go anywhere else for help. I appreciate especially the collecting tips Scott has shared saving us $10,000s. We have trusted FACL in Santa Barbara since 2002 with all our work, especially with our most difficult restoration projects, knowing that the art conservation treatments will be done right the first time. Wendy Adair told me she has the highest regard for Scott Haskins and his work. She has loved working with him. Thanks for these testimonials. They were helpful. Nice testimonials. You sound like you know what you are doing. I can “second” the testimonials on this page. I have had the pleasure of doing business with FACL several times and their work is always 1st class. But one thing that is also important to me, especially when I sell something, is that dealers and the auction houses recognize FACL’s label and know Scott Haskins and recognize the quality work. His reputation precedes him. Thanks Megan for the posting. Its been a BIG project and one that I have been honored to be a part of. I have enjoyed working with your company and personnel very much. Scott’s been working with us in part as a conservator on our very large historic preservation project (we are Historic Preservation Designer architects) and partly as a consultant who helps us keep quality control on an artist whose new mural work must blend with the historic mural work. THANK GOODNESS for Scott and that he is on our project!!! Scott’s problem solving, his attention to construction timelines, his immediate response when we had a water main burst and his quality work were extremely important on this project. I don’t think the artist would have ever “dialed in” his work without Scott. I’ve enjoyed working with him immensely and I am thankful he was with us on this project. We have worked with Scott and his team on several projects and have loved working with him. We felt comfortable with his consultation and the other conservators are “on it” too. Thanks for posting these. Very helpful. Kudos to Scott and rest of the FACL team for pulling off this extraordinary feat! They have with their tremendous skill and perseverance made the S.F residents proud. Wow, that was some awesome collection in “Here Is George Stern Fine Arts in West Hollywood, CA” Video. There were only 4 paintings shown and I would like to see more of your work at his gallery.